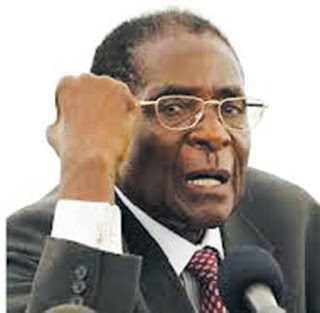 If there are economic sanctions to talk about as major stumbling block to our economic growth, surely that sanction is President Robert Mugabe himself, Zimbabwe People First (Zim PF) has said. Firebrand Zim PF Masvingo Provincial Spokesperson, Retired Colonel Kudzai Mbudzi, has dismissed Mugabe's sanctions mantra saying it is himself who is the real sanction responsible for the suffering of Zimbabweans, saying the economy will start to perform if he resigns. Mbudzi also took a swipe at war vets likening them to 'stubborn flies which go with a corpse into the grave' after the liberation fighters continue to side with Mugabe. "For a long time now, Zanu-PF has been hiding behind a finger blaming sanctions over the collapse of the economy when in fact they are the ones who have led us into the abyss. "Zanu-PF has made policies which have scared away investors and they blame sanctions. It is time for Zimbabweans to wake up and realise that they are being fooled by the sanction talk. "Mugabe is the only sanction we have to talk about and deal with. If Mugabe is out, you will find more investors coming and the economy will be back to its glory days. Investors are afraid of Mugabe that is why no one is coming to invest in this country," Mbudzi said. He added that Mugabe is the only person who has bad blood with the international community which has the means to help the country out of the economic chaos created by his party. "If you want the economy to blossom, you need to come up with friendly policies which attract investors and have a leader who is friendly to the investors, failure of which will result in an economic catastrophe as is our case in Zimbabwe. Mbudzi said war veterans are 'blind' and thus Mugabe insults them all the time. "War Veterans should wake up and smell the coffee. Mugabe doesn't like them yet they continue to follow him like blind people. We warned them long ago but they did not listen. They thought we are the mad ones but today they are being called dissidents. "Stubborn flies will be buried with the corpse," said Mbudzi.